After reading the last riveting page of âThe Looming Towerâ? [Knopf: 2006] by The New Yorker staff writer Lawrence Wright, something tugged at my memory. One of those annoying nudges that wonât let goâso I was relieved when I remembered it was a book I had read a few years earlier. That book was called âCharlie Wilsonâs Warâ? [Atlantic Monthly Press: 2003] written by veteran 60 Minutes Producer George Crile. (I have since learned that Charlie Wilsonâs War is going to be a major motion picture, starring Tom Hanks, with a release date of 2007. I donât know if the fact that Hollywood is weighing in diminishes my little book review but I thought I should tell you that). “Charlie Wilsonâs War” and “The Looming Tower” should be read together. They are parts of a whole or maybe a partial whole if such a concept exists. “Charlie Wilsonâs War” tells the truly incredible story of a womanizing, hard drinking, partying US Congressman and the huge role he played in âthe CIAâs secret war in Afghanistanâ?. That congressman was Charlie Wilsonâand this very tall Texan with a booming voice became enthralled with the idea of the colorful mujahideen, who, armed with ancient weapons, risked their lives to fight off the Soviet superpower that had invaded their country in the 1980s. See why it has all the makings for a movie with Tom Hanks? Wilson sat on the powerful Defense Appropriations subcommittee and with one phone call was able to increase funding to the mujahideen but a great deal more money was needed and thatâs where the CIA comes in. 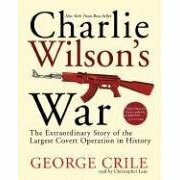 At the time, according to author George Crile, the CIA was backing anti-communist causes in Central America, like the Contrasâin fact, until Wilson convinced them to focus on Afghanistan instead, the CIA believed Central America was the focal point of the Cold War. Once on board, the CIA came to believe that Afghanistan was an excellent project for them– and by focusing on the mujahideen, the Muslims might forgive the US for having supported the Shah of Iran and, of course, continued support for Israel. Wilsonâs influence and role is so big that when the Soviets are booted out of Afghanistan and the Cold War is officially declared dead, the 6â8â? Texan was honored at CIA headquartersâ a hallowed place where outsiders are rarely welcomed. 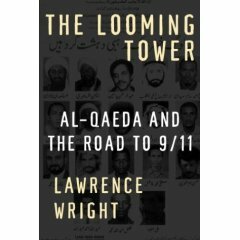 While Crileâs book echoes the role of the CIA in Afghanistan, Lawrence Wrightâs “The Looming Tower”* talks about the rise of radical Islam and gives a lot of credit to the FBI for their anti-terrorism activites. Most intriguing is the description of the Egyptian educator Sayid Qutb, who attends a university in the American Mid-West, appears to like the school and the people, when he actually despises everything about what he views as the superficiality of American culture. After leaving the US and returning home to Egypt, Qutb becomes famous as an intellectual writing about what later became well known as Islamic Fundamentalism. His work attracted many followers, who in turn became more and more radicalizedâfinally interpreting as moral, the killing of anyone who is not a true Muslim, the present definition of a Muslim terrorist. Given an understanding of the roots of modern Islam, the author Lawrence Wright moves on to terrorist bombings including two American consulates in Africa, the bombing of the Cole, the ultra modern naval vessel that was refueling in Yemen, and the 1993 bombing of the Twin Towers. These events bring in John OâNeill, the FBI chief of counter terrorism and his futile attempts to find and charge all of the major terrorist culprits. Author Lawrence Wright makes it clear that the FBIâs John OâNeillâs efforts are continually frustrated by the CIA– by the wall of silence that falls between the FBI and this other powerful spy agency. OâNeill, after resigning from the FBI, went on head up security in the Twin Towers where, ironically, he died on 9/ll. *I have just learned that ABC-TV will be airing “The Path to 9/11” a miniseries, with Harvey Keitel starring as FBI counter terrorism chief John O’Neill. 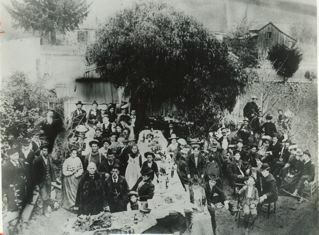 In Part 2 Bill Miramontes was telling me about the rise & demise of the Ocean Shore Railroad– that the main reason for its failure was the stiff competition from cars and trucks (that could transport vegetables from Half Moon Bay to market in San Francisco faster). Bill: The train just ran out of passengers and freight because it was so much better to buy fresh vegetables picked the same day and have [the produce] at the market the next day. If they put the vegetables on the train they had to pick it, sort it and then bring it down to the train and it would stay there one or more days on the tracks. It could be three or four days before it got to the market. Bill: When they got solid tires, trucks were better than cars. They were slow, even 8-10 miles per hour but they’d leave at 10 and get to San Francisco at 1 or 2 in the morning. Bill: The artichoke was a big item in those days, fresh and green. When shipped by the train artichokes would be–after you pick them–and they sit for 2, 3, 4 days–they get kind of withered and dark. Bill: People started buying Fords or cheap cars and they’d go to San Francisco in an hour and a half. On the train it would be an all day trip. The Ocean Shore Railroad ran out of passengers and that’s why they failed. 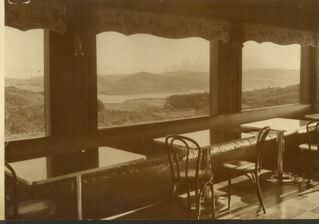 Mountain House: Overlooking Crystal Springs Lake on Skyline Blvd & the Half Moon Bay Road, circa 1930s? Most cities are broke and their highways aren’t being fixed and their schools are falling apart– but San Mateo has a library–there might not be half a dozen libraries in the entire world that compare with this new library on 3rd avenue that takes up almost an entire square block. If you haven’t seen it, you gotta go. It was closed today, Labor Day and I just admired it from the outside. There are not many really pretty buildings, public or otherwise, and this one is just smashing. I walked around the entire building and peered into the windows, some of them round like giant portholes. There are sculptures and benches and the inside (which I hope to see soon) looks cutting edge, worthy of the county where high-tech was born. It’s certain to be a touristy place to go–this library is one we can all be very proud of. Now if only we could get private funding for an exceptional new Coastside library. 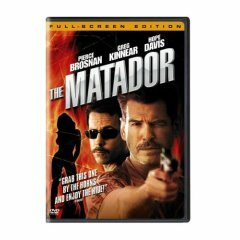 We watched “The Matador” (2006) starring Pierce Brosnan on the tele last night. You know Pierce Brosnan is still identified with the sophisticated, high-tech James Bond, the British MI5 agent whose victims are very evil–and whose women are ooh la la. But the star of the darkly humorous film Matador is Julian, a crudely unsophisticated Brosnan (but still handsome, I think, even when he reveals his teethy teeth)–a stark contrast to the polished Bond with the proper English accent. So turn everything you know about the celluoid Bond upside down, inside out and round and round you go and you get Julian, an assassin whose assignments are passed to him by an unseemly agent on the streets of the world’s cities where Julian is eyeing “illiterate teenage girls”–he is a womanizer, who instead of making love with a gorgeous model at the Ritz in Paris, is found cavorting at the low-end bordello. There are only 3 main characters in this darkly funny film. Greg Kinnear plays Danny Wright, the Denver-based “loser”–a traveling businessman who is seduced and corrupted by the deliciously amoral Julian. Most of the movie takes place in foreign cities but the final scenes unfold in Denver at Danny and his wife “Bean”‘s home (with Hope Davis perfectly playing “Bean”, a young numb matron ready to swing). You may find it hard to identify with Julian but I loved him. Julian rationalizes his sordid “gigs” to an innocent Danny by telling him his victims are generically bad. Danny is so sucked into Julian’s web that he becomes an accomplice in Julian’s “final” assignment. What is really irrestiable about this movie is that Pierce Brosnan turned an original character that was was just a typed decription on a computer screen into a real, believable person. *Note: If you’re wondering what Mike’s wife drives, he says “Hondas”. BTW: How come my old high school boyfriend’s dark green ’57 Chevy didn’t look this good in 1963? P.S. This car was also photographed for a calendar–has anyone seen it? Mike didn’t get a copy. Please send him one.